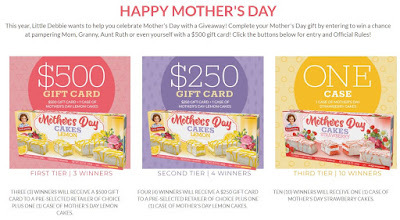 Prize Details: First Prize Winners will each win (i) one (1) case of Little Debbie® Mother’s Day Lemon Cakes (ARV $35.04); and (ii) one (1) $500 gift card from their choice of one of Merry Maids, Bed, Bath and Beyond, Amazon, Walmart, Target, or SpaFinder (each, a “First Prize”). Second Prize Winners will each win (i) one (1) case of Little Debbie® Mother’s Day Lemon Cakes (ARV $35.04); and (ii) one (1) $250 gift card from their choice of one of Merry Maids, Bed, Bath and Beyond, Amazon, Walmart, Target, or SpaFinder (each, a “Second Prize”). Third Prize Winners will each win one (1) case of Little Debbie® Mother’s Day Strawberry Cakes (ARV $35.04).